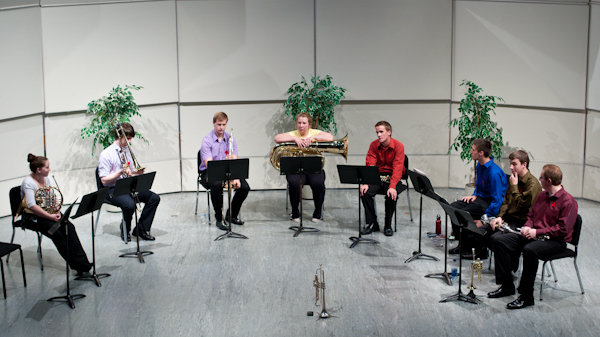 Kwantlen’s brass ensemble played pieces by Beethoven, Mozart, Verdi and others as part of Music at Midweek, on Wednesday, Nov. 5 at Kwantlen’s Langley campus. The ensemble — four trumpets, two French horns, two trombones and a tuba — had been preparing for the performance since September under conductor Thomas Shorthouse, principal trumpet with the Vancouver Opera Orchestra. “He, being a trumpet player, he’s the trumpet teacher, so any trumpet players here get one-on-one lessons with him,” said Adam Junk, one of the four trumpeters. Junk wrote an arrangement specifically for the performance, called Papa Tom’s Pizzeria. The piece featured excerpts from the Godfather theme and other Italian-flavoured songs. The free show was part of the Music at Midweek series of musical performances put together by Kwantlen’s music department. Each Wednesday, until the end of the semester, a different ensemble performs for about 45 minutes in Kwantlen Langley’s auditorium at 12:15 p.m.